Swarovski AB Jet Crystal with Crystal Tear Drop Pendant Necklace. The value of Swarovski Crystal is timeless adds a bit of tradition & giving your true love is a classic statement of love & care for her with Swarovski Crystal Jewelry. & of course SWAROVSKI are the best! Nothing shines sparkles or dazzles like genuine Swarovski Crystal. This is one made with better craftsmanship or finer components. 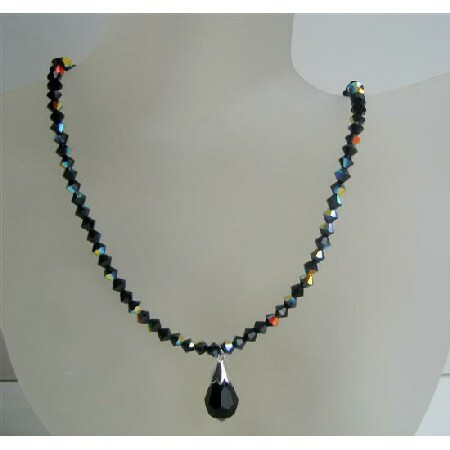 These handmade beaded necklace are handcrafted with 100% Swarovski Austrian crystals Swarovski Ab Jet with crystal Swarovski darling crystal.